Trump's profanity-laced tirade: Leaders "stupid"
LAS VEGAS - Real estate developer Donald Trump unleashed a tirade of profanity in a speech at a boisterous Las Vegas casino as he assured a crowd of adoring supporters Thursday night that he is seriously weighing a presidential run and will make a decision soon. "Our leaders are stupid, they are stupid people," he said. "It's just very, very sad." The setting was fitting for the casino mogul whose moniker is draped across the gold-tinged Trump International Hotel & Tower just off the Las Vegas Strip. An open bar greeted more than 1,000 people, waiters passed hors d'oeuvres and a Trump impersonator entertained the crowd. At one point, a woman in the lavish reception at the Treasure Island casino on the Las Vegas Strip yelled out that Trump should run for president. "I think I am going to make you very happy," the developer said. But he later said: "There is a really good chance that I won't win because of one of these blood-sucking politicians." Trump blasted President Barack Obama's handling of Libya, Iraq, China and Afghanistan, and in one of his many curse-bombs, he lamented the nation's focus on building schools in war-torn Afghanistan, while neglecting education in the United States. He said he wouldn't help struggling nations such as South Korea or Libya without payment and promised to use swear words while negotiating with China. "I'm not interested in protecting none of them unless they pay," he said. Trump has created waves by questioning whether the president was born in the U.S. Obama produced his detailed Hawaii birth certificate on Wednesday, and Trump eagerly took credit for the reveal. 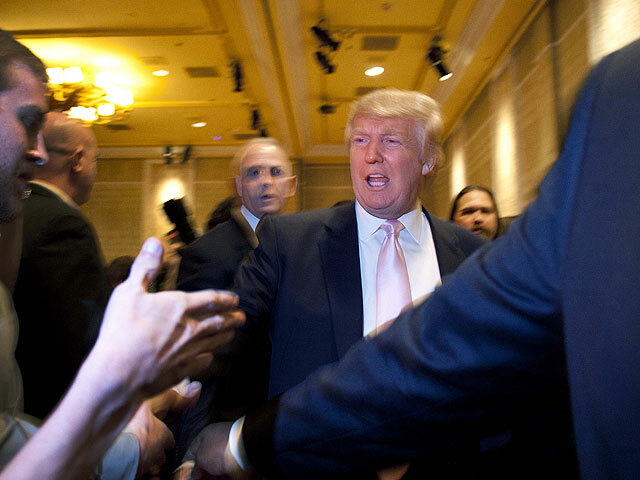 Trump's visit to Nevada came a day after he traveled to New Hampshire, which is set to host the first presidential primary in 2012. Nevada's caucus is scheduled to be the third presidential contest next year. Trump hosts the successful reality series "The Celebrity Apprentice" on NBC. "I would have to give a lot of stuff up," he told the casino crowd Thursday. "But you know what? It is peanuts compared to the importance of this country."